Snakes come in a wide range of colors and lengths. They are cold-blooded, and hibernate in the winter. There are many different types of snakes that live in Virginia. Most of them are harmless, but a few species are venomous. In the wild, snakes are a vital part of the ecosystem and rarely pose a risk to humans if they are left alone. There are three varieties of venomous snakes that live in Virginia. These snakes rely on the venom from their bite to kill their prey, while most non-venomous snakes will curl around their victims and constrict them. All snakes, venomous or not, should be avoided if possible to reduce the risk of a bite. There are 30+ species of non-venomous snakes in Virginia. They range in color from brown and black to greens, yellows and reds, and can grow anywhere between 7 to 70 inches long. How can I prevent Snakes from coming in to my home? Snakes thrive in areas where they can hide. 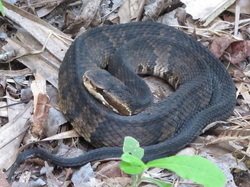 If there is tall grass around your home, or if you have wood piles or other similar objects, snakes may take up residence. Clearing away these items may prevent snakes from staying around your home for too long. It’s also a good idea to seal any holes that may provide entry into the inside of your home or other buildings on your property. It is always a good idea to contact a professional to assist in identifying and removing a snake from your home, no matter what variety of snake it is. Give us a call or shoot us an email and we will be happy to help you with your Snake control problem! 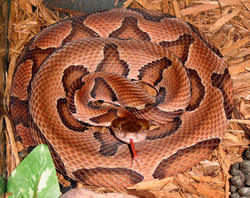 Venomous Snakes found in and around Richmond, VA.
Click here to learn more about Northern Copperheads!